I picked up We Were Liars by E. Lockhart because it was the February pick for Indigo's #WorldsBiggestBookClub monthly book chat. It's a very fast paced book and I managed to get through it in a few hours. We Were Liars was an enjoyable mystery with a great twist at the end. The book is narrated by Cadence Sinclair. The eldest grandchild of Harris Sinclair. The Sinclair's are descendants of the pioneers who came to North America on the Mayflower. They are beautiful and they are rich. Every year, the Sinclair's spend their summers on their grandfather's island, Beechwood Island, right off the coast of Martha's Vineyard. Cadence enjoys her time on the island especially with her cousins Mirren and Jonathan. During their eighth summer at Beechwood, Jonathan's mother brings along her boyfriend's nephew, Gat. From that summer on, the four were known as the Liars. Gat continues to accompany the family to Beechwood every summer and eventually builds a strong bond with Cadence. Summer Fifteen is when it all changes. One night, Cadence is found on partially submerged in the ocean wearing on her underwear and appears to have a head injury. After weeks of medical checkups and drug prescriptions she is eventually diagnosed with Post-Traumatic Headaches. One of the symptoms being amnesia. Cadence is unable to remember the events that resulted in her accident. Two years later she returns to the island, her mother believes the rest will do her some good. Cady on the other hand believes that she'll be able to piece together what happened to her. Although I managed to figure out the ending halfway through, We Were Liars was still an enjoyable down to the last page. I also liked the modified Fairy Tales that were scattered throughout the book. They were rewritten to mirror the events that were happening in the story. It was a creative way for the author to get her readers to think about Cadence's situation. 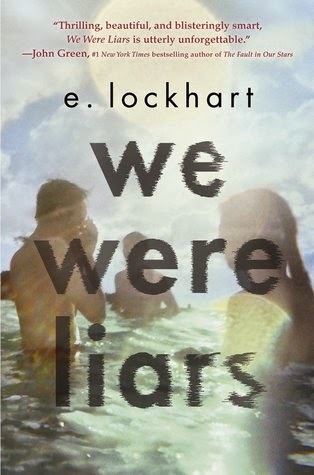 What do you think about We Were Liars? Were you shocked at the ending or did you find it predictable? Indigo's #WorldsBiggestBookClub read for March's read I'll Give You The Sun by Jandy Nelson. Will you be joining in the discussion?